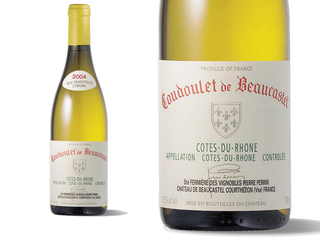 The real winner is the 2004 Coudoulet blanc, which is just stunning and one of the finest examples of Coudoulet blanc I have tasted. It has all the elegance of the 2005 but even more fruit, more exuberance, and more body and length. 2004 was a terrific vintage for white varietals in the Rhone, both north and south, and it comes through in spades in this beautiful effort. Drink it over the next 2-3 years. Herbal, aromatic nose. Quite zesty and a nice, if slightly simple drink for now. Golden honey colour. Quite tense and restrained on the nose. Very complex but not yet singing. Still quite astringent on the finish. Powerful. The Viognier is quite low key – not peachy, but full bodied and intriguing. Organically grown. 30% Viognier, 30% Marsanne, 30% Bourboulenc, 10% Clairette. 20% oaked.